Today, when I watch reality shows like Survivor or repeat episodes of Fear Factor, I have to chuckle. You think building a hut or sticking your hand in a tub of worms is hard? Try treading through a minefield in rural Cambodia moments after hearing one go off; or carrying 50lbs worth of gear up a mountain in the Borneo Jungle while leaches feast on every vein in your body; or sweeping through the Helmand desert in Afghanistan with elite special forces commandos. When you hoist a camera and a note pad for a living and decide to venture into the unknown--the game you play goes like this: If you lose, you die, and if you win, you get to do it again, and again, and again, and watch as friends die, until you die or retire. Period. You don't study to become an expert in war zones or how to shoot and survive in remote environments--you just do it, and grow into the role. And as far as survival is concerned, you don't get better at "surviving;" you just keep getting lucky. But make no mistake--for the men and women that do what we do, luck is like a blind trust fund--you can make withdrawals but not deposits--and you have no idea how much is left. Photo: Orphaned boy in Afghanistan, 2008. I have been on fast-forward for most of my life, racing to keep ahead of the demands of an ever-changing career in the media industry. 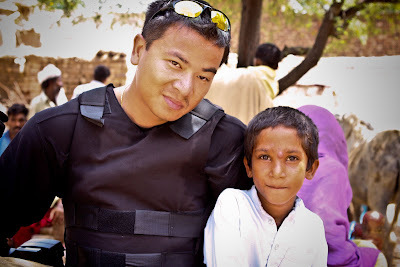 Writing has given me a chance to pause and reflect a little on myself, but mostly on the dilemmas I have faced covering shattering events around the world. I am grateful to the many people I have met who allowed a clumsy journalist into their lives. I think about them late at night when I cannot sleep. What happened to the abandoned boy with the harelip in the Baghdad hospital? Did your mother come back to get you after the siege? And the hungry little boy who followed me all morning in Port Au Prince asking for my pen. I wish I'd given it to you. I only had one. The Afghan orphan I left studying by candlelight--did you become a teacher as you wanted? The boy in Gaza paralyzed by a bullet to the neck--did you get a wheelchair that would go through sand? If I could revisit the thousands of people I have filmed in the worst moments of their lives, I would apologize for having intruded on their suffering. I would share with them my belief that by telling me their stories they have helped in some small way to make the world a better place. In a world obsessed with celebrities, leaders, and wealth--one thing I am not ashamed of is the route that I have taken and the direction I've decided to point my camera. I'm determined to shed light on the forgotten, focus on those left behind, those paying the price. And in many ways, I hope to provide an answer to all those who ever dare to ask "why should we care?"